Flourish is one thing, but Anthro takes it to another level with the Knotty Pine Cardigan. 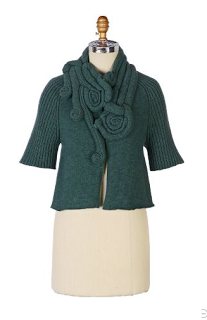 My first thought when I saw this cardigan was “Ursula!” The color is gorgeous but the fabric around the neck does evoke tentacles. One the one hand the neckline looks like it would keep you very warm. On the other hand it looks like you have some kind of fabric sea creature around your neck. What do you think of the Knotty Pine Cardigan? I rarely buy anything from Anthropologie full price– I just wait for the clearance and hope that the stuff I like is still left in my size. The Knotty Pine Cardigan was an exception for me. I just had to have that. I pair it with a white long-sleeved t-shirt and grey wool pants and wear it to the office on casual Fridays. That outfit sounds perfect for a casual Friday. You know, I just saw someone on the street wearing the cardigan the other day and she looked gorgeous in it. Made me rethink my position on the cardigan to be sure.